We had a Q&A style Google Hangout today with a few customers that had questions about the new Mailchimp integration. We didn’t go over the process again – you can watch that in the previous hangout. Unfortunately, due to a technical mishap, only Matt could be heard on the audio on the recording, so it’s only got half the conversations. Instead of posting the recording, here are some of the questions that came up. A. We need to switch it on for you – please contact us. You’ll also need the communications module to store logged campaigns. Once that’s done, you’ll see the main settings in admin -> system administration -> change global settings (on the communications tab). Q. I already have a list in Mailchimp set up; now I want to link it with Lamplight. How does that work? A. First you’ll need to set up Lamplight with the API key from Mailchimp (see previous video). Then choose the list you want to use in the system admin section. Next, go to the main admin menu (admin -> system administration) and you’ll see a link to ‘Import data from the Mailchimp list’. Click this and Lamplight will schedule a job to import the people on your list. If someone is already on Lamplight (matched by email address), they won’t be added again. If they’re not, Lamplight will create a simple profile for them, as a service user. These new profiles won’t be added to any groups in Lamplight, and their profiles will only have names and email addresses. You’ll need to update their profiles and add them to a group in Lamplight, and then sync that back to Mailchimp to create a segment you can use in campaigns. You should only need to do this once. Q. I sent a campaign in Mailchimp, and although the main content of the message came into Lamplight, it didn’t link to any profiles – in Lamplight it looks like it was sent to 0 people. 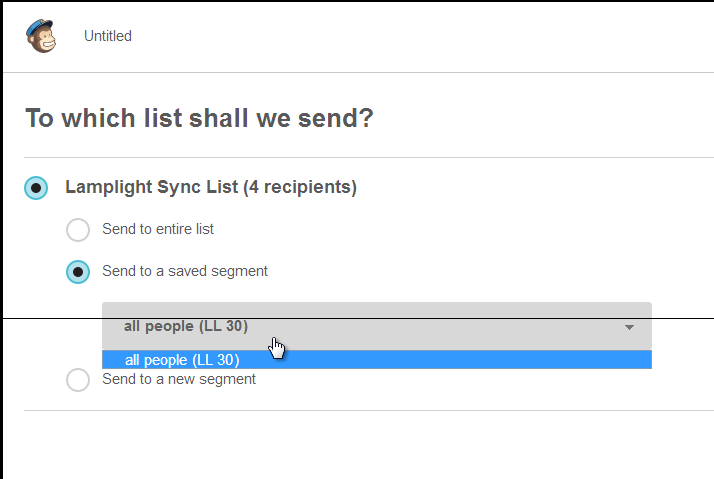 A. Lamplight connects groups to ‘segments’ of lists in Mailchimp. If you send a campaign to the list (or to a segment that you’ve made in Mailchimp, not Lamplight), then currently Lamplight can’t work out who it was sent to. Basically, you need to use a segment that’s ‘come from’ Lamplight. Your segment might include everyone in the list – that’ll work fine. You’ll need to set up a group in Lamplight that includes everyone in the list, and then sync it to Mailchimp. When you create a new campaign in Mailchimp, make sure you select ‘Send to a saved segment’ in the ‘to which list shall we send’. You can spot the Lamplight linked ones because they’ll be called something like “Newsletter recipients LL123” where the LL123 is LampLight group ID 123. The reason for this is that Mailchimp lets you have lots of lists, but they recommend that you don’t have the same person appearing in multiple lists. Because groups in Lamplight will often have the same person in several, we felt it was going to work best to use a single list with segments.